A mad dash for the microphones started when a United Federation of Teachers (UFT, New York City, Local 2 of the AFT), delegate began sprinting as the doors were opened for delegates to enter the floor of the national convention of the American Federation of Teachers on July 13, 2014 in Los Angeles. Was it a cover tribute to the Los Angeles Olympics of decades ago? No. The 3,000 delegates to the AFT convention were about to debate Common Core, and the 200,000 - member UFT (the "United Federation of Teachers," New York City's huge local teacher union) was about to defeat their Chicago "brothers and sisters" on a resolution or two that had acquired national importance. The question was straightforward: Could the 1.6 million member AFT reject Common Core or would it continue to try some compromise? 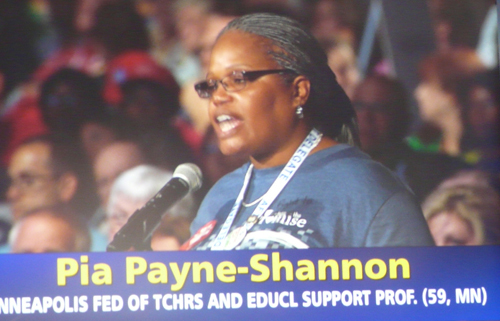 All of those who spoke against Common Core at the AFT convention were classroom teachers, like Pia Payne-Shannon from Minneapolis (above speaking during the debate). Most of those who spoke from the floor in support of the "standards" resolution which the AFT leadership poised against the Chicago Common Core resolution were union officials, including the presidents of the New York City and Detroit local unions, neither of which presented a classroom teacher to speak on behalf of Common Core. Substance photo by Kati Gilson.Poised in opposition to the continuation of what amounts to "critical support" for the Common Core -- favored by New York and the AFT national leadership -- was the outright opposition to Common Core among teachers and other union members. That opposition had been brought to the floor of the convention by the Chicago Teachers Union (Local 1 of the AFT). The dash to the mics, in the eyes of many at the convention, was just a continuation of the bullying, underhanded tactics used by the UFT -- to "win at any price" more than one delegate noted -- on issues of importance to the national union leadership. It was a race to the finish line -- the "good seats" in the cavernous hall at the Los Angeles convention center. A CTU Delegate started running, passed the UFT Delegate and was able to claim a spot near the microphone. Why the rush? The issues to be debated, then voted on included a vote on the Common Core State Standards. The jockeying for position began two days prior when the Educational Issues Committee met to decide which resolutions would go forward to the floor two days earlier. Under AFT rules, any local may submit resolutions for the consideration by the general convention, which meets every two years. But then the resolutions are divided up among more than 20 committees, each of which debates them and makes a "recommendation" of which get to the floor of the convention. In the "Educational Issues" committee there were two competing resolutions on Common Core. One from the AFT national leadership continued support for Common Core. The one from Chicago was outright opposition. [The text of both resolutions are reprinted in full here at substancenews.net at the URL: ]. One of the ways in which business is conducted at AFT conventions is that all resolutions submitted from across the country are sorted and assigned to committees on various topics, from higher education and international relations to "educational issues." Each committee may discuss, in two hours on the convention's first day, as many as a dozen resolutions. But only three resolutions are usually submitted for debate on the floor of the full convention. Resolutions that are approved by the full convention after debate become national policy, often authorizing the union's national office to devote resources to that position. Before Common Core came to the floor, it went before "Ed Issues" (the "Educational Issues" committee of the convention). Delegates are assigned to the committees, partly according to preference. Most of the committees have fewer than 100 delegates assigned to them. When the Chicago delegates arrived in Los Angeles, we discovered that "Ed Issues" had 800 delegates assigned to it, at least half from New York. The scramble that was later seen on the floor of the general convention had been foreshadowed in "Ed Issues." Prior to the Educational Issues Committee meeting there had been another session in the same room. Chicago Teachers Union members arrived well before the first event to get seats near the mic. Shortly after the meeting began it was announced that the room must be cleared before the committee session. (This was not done in all the committee meetings). It became obvious that the education committee meeting was being set up for the benefit of UFT. Those teachers who were seated by the mics excused themselves prior to the end of the meeting and lined up in the hallway. As other delegates began to arrive, they started to swarm the doors and had to be reminded by sergeants at arms that there was a line and they needed to get at the end. Once the room was cleared the delegates were allowed in. Two CTU delegates were pushed by UFT Delegates. The UFT Delegates, with what many of us considered their Al Capone style and muscleman tactics, were determined to bully their way through the resolutions. [Disclosure: this reporter is one of several Substance staff members who were among the CTU delegates to the convention]. Their tactics were formidable, but their arguments were not always to the point. More than once, they insisted that the issue was really whether teachers really wanted "standards," rather than the impact and reality of the Common Core the country has been experiencing. Michael Mulgrew, the President of the UFT, proceeded to talk about �fighting for what�s mine, fighting for my rights�. Where that fits into a discussion on education is debatable, and many listening were left shaking their heads. The Chicago Teachers Union delegates were to the point in speaking about Common Core and not in abstractions or diversion. CTU delegates who were able to get to speak presented valid documented arguments based on classroom experience and parent interaction. Almost every one of the CTU delegates who spoke, whether in committee or during the floor debate, was a classroom teacher. The only union staffer who spoke against Common Core was CTU research chief Carol Caref on the floor; CTU vice president Jesse Sharkey spoke against Common Core in committee. That couldn't be said for most of those who spoke in favor of the Common Core -- supporting the resolution in favor of "standards" that was "critical" of Common Core. It became apparent that it wasn�t going to be a debate about what�s best for the students, but what UFT -- and more broadly the leadership, which has always been centered in New York -- wanted. These �thugs� were not teachers, delegates noted. As the days of struggle unfolded, more and more delegates noted that they were bullies sent to block any attempt by the CTU to have an honest open debate about issues including Common Core, high stakes testing and special education in the context of "education reform" in 2014. The Educational Issues committee managed to shove through every resolution, including one supporting common core state standards for early childhood -- which is Pre-K � 3rd. The only resolution they did not push forward was anti-testing special education which was sent back to the executive council after a maneuver. It appeared to this reporter that the UFT was more interested in knocking down CTU resolutions than listening to the arguments and applying that information to the students they serve. That was what happened in committee, on July 11. Fast forward to July 13, when the item was scheduled to come to the floor. Once the mad dash for the microphone race was over, the real UFT jockeying, politicking and questionable tactics became evident at Microphone 4. (There were eight microphones for debate in the large auditorium, each on with a lighted (or unlighted) sign which indicated to the chair of the meeting whether there was someone who wanted to speak. The melodrama at Mic 4 was typical of several mics. There were four chairs behind the microphone. On was occupied by UFT and two by CTU. The fourth chair was designated for the Sergeant at Arms. 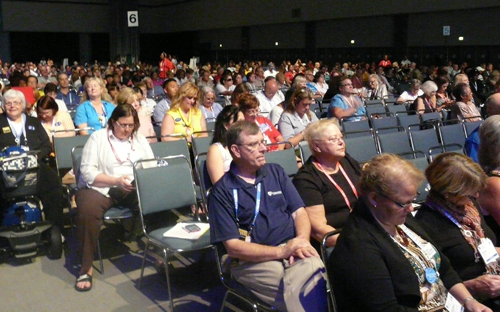 Part of the vast crowd of more than 3,000 delegates and other union members who were at the AFT convention in Los Angeles on July 13, 2014 when the Common Core resolution was debated. Substance photo by Kati Gilson.A UFT Delegated brought another chair to the row and proceeded to seat two UFT Delegates in the row. The Sergeant at Arms repeatedly told them they could not do that. The head of the Sergeant at Arms was called and after much debate, and one chair was removed. I explained to the Sergeant at Arms that the fourth chair had a �Save for Sergeant at Arms� sign on it. He said he knew that -- but it was his seat and he chose to give it to a UFT Delegate. All of the Sergeants at Arms were convention delegates, many from the CTU. This particular Sergeant at Arms was also a UFT Delegate and had to be repeatedly reminded that he could not stand in front of the mic, an obvious tactic, to block CTU from reaching the mic. When the Common Core Resolution came up, there was a great deal of controversy about who was at the mic first. This reporter, who had been walking around the convention floor, with her press credentials, who has been walking around, taking pictures since day one was denied her First Amendment rights and told she must remain seated because she was also a Delegate. This was interesting because UFT Delegates were repeatedly up and out of their seats, walking back and forth, attempting to control who said what at the mics, and often taking photographs. Despite being repeatedly pushed, CTU Delegate Sarah Chambers held her ground and was returned to her rightful place as first in line. Her impassioned speech was loudly cheered by a large number of delegates, and is also on the video of the debates. Throughout the Common Core Resolution Debate, UFT thugs and delegates swarmed around microphone 4, constantly getting up to talk to each other and changing places with the people in line behind the microphone. The resolution on the floor, "Number 2" from the resolutions booklet, had been submitted by the national union leadership and critically supported Common Core. Another heated debate occurred regarding this resolution. Many of the people who spoke for the motion to pass were not classroom teachers who, are in the trenches daily with their students, living and breathing the nightmare of common core. It was easy to identify the teachers in the group by their passionate, well informed, presentations on the issue. Union officials who were at the mics to speak (often with the help of the aforementioned tactics) included Michael Mulgrew, President of the UFT, and Keith Johnson, President of the Detroit Federation of Teachers. Chicago delegates who got to the mics spoke unanimously against the Common Core Standards. After talking to numerous delegates at the convention, it was made clear to this reporter and others that many more oppose the Common Core, but were afraid to vote against it. One delegate, among many who asked to remain anonymous when told we would report it in Substance, told me �I vote the way my union tells me to�. It became apparent the "member driven unionism", such as CTU, is not the norm across the country in the American Federation of Teachers. One delegate I spoke with was unable to identify the Secretary of Education. Although the national office version of a Common Core resolution passed, many people -- including many from New York's UFT and others who were afraid to "vote against their union" -- came up to CTU members and thanked them for their passion and bringing the �ommon Core issues to the floor. A times, almost always provoked by UFT speeches rife with cliches (and some macho posturing), almost overwhelmed what we were debating. As one Delegate stated as she spoke, �We�re not throwing the baby out with the bathwater. There was never a baby in there to begin with!" In that case, the "baby" was supposedly "standards" (which according to the debate were good) and Common Core tests (which virtually everyone but a handful agreed are not so good). So the AFT, with 1.6 million members, has voted to continue in support of the Common Core -- albeit critically. Supposedly, the AFT leaders will be doing around fixing Common Core so that standards are saved.It will be interesting to see, in two years at the next AFT convention (where the Chicago delegates will be the same people), where the supporters of Common Core stand after they�ve lived the nightmare Chicago has been living for the past couple of years. But, then, by then it's possible that not one classroom teacher will be available for the UFT and others to throw into the mx to speak again in favor of Common Core. Somehow, nobody doubts that union officers and AFT officials will be first in line at the mics for that round of debates. "LOS ANGELES� AFT members today passed a resolution at the union�s national convention reaffirming the AFT�s support for the promise and potential of the Common Core State Standards as a way to ensure all children have the knowledge and skills they need to succeed in the 21st century while sharply criticizing the standards� botched implementation. The AFT�s resolution lays out key actions needed to restore confidence in the standards and provide educators, parents and students with the tools and supports they need to make the standards work in the classroom. The resolution, �Role of Standards in Public Education,� resolution passed following an intense, extended debate on the convention floor. Educators expressed their frustrations and anger with how the standards were developed and rolled out, without sufficient input from those closest to the classroom and without the tools and resources educators need to make the transition to the new rigorous standards, even as states and districts rushed to test and hold teachers and students accountable. AFT members also voiced their distrust of efforts by those seeking to make a profit off the new standards. No matter where members stood on the issue, there was clear anger over the deprofessionalization of teachers throughout the implementation process. At the same time, however, many educators shared how they�ve witnessed, when done right, how these standards more from rote memorization to provide children with the deeper learning the standards were designed to produce and that the standards remain the best way to level the playing field for all children. Proponents of the resolution made clear that it resolution offers solutions to fix the poor implementation and includes a call for greater teacher voice. � Reaffirming the call the AFT made more than a year ago for a moratorium on the high-stakes consequences of Common Core-aligned assessments for students, teachers and schools until all of the essential elements of a standards-based system are in place. �What educators and parents are saying is,: �Yes, we want our children to have the knowledge and skills they need for life, college, career and citizenship.� But to make that a reality, our voices need to be involved in a meaningful way, and we actually have to focus on the learning, and not the obsession with testing,� said Weingarten. Stephen Sawchuck did a good job reporting the heated debate about the Common Core standards at the AFT convention. The Chicago Teachers Union wanted to dump them. The head of the New York City United Federation of Teachers mocked the critics of the standards. One union official said that the critics represented the Tea Party. That's pretty insulting to the Chicago Teachers Union and one-third of the AFT delegates, as well as people like Anthony Cody, Carol Burris, and me. As far as I can tell, no one explained how states and districts will find the hundreds of millions of dollars to pay for hardware and software required for "the promise of Common Core." Early estimates indicate that Pearson will have a contract of $1 billion to develop the PARCC tests. Who will pay Pearson? Who will be laid off? How large will class sizes go? There were no Martians on the committee that wrote the Common Core standards, but there were also no classroom teachers, no early childhood teachers, no special education teachers. There were a number of testing experts. Frankly the best and only hope for the future of these standards is that they are totally decoupled from testing. It is not likely to happen because doing so would deny the privatizers the data to prove that schools are failing and must be closed at once. That's where the next big fight will occur. Will they prepare all children for college and careers? Nobody knows. Will they help prepare our children for "global competition?" Not likely if the global competition works for $2 an hour for 18 hours a day under unsafe conditions. The Common Core standards will never be national standards. They were developed in haste, paid for by one man (the guy is Seattle who thinks he knows everything), sold to the public via a slick PR campaign. They were never tried out. The tests connected to them are designed to fail most kids. Arne Duncan and Bill Gates thought they could pull a fast one and bypass democracy. Sorry, boys, you are wrong. Public education belongs to the public. Children belong to their parents. Neither public education nor children are for sale. "We heard a lot of passion today, all in support of student needs and teacher professionalism. And where our members ended up is that we will continue to support the promise and potential of these standards as an essential tool to provide each and every child an equitable and excellent education while calling on the powers that be in districts, states, and at the national level to work with educators and parents to fix this botched implementation and restore confidence in the standards. And no matter which side of the debate our members were on, there�s one thing everyone agreed on, that we need to delink these standards from the tests." Of course, the big question is What This All Means for both the union and the standards' political future. Here's what comes to your intrepid news blogger's mind: � AFT members are deeply divided about these standards, largely because implementation has been so varied. That makes it much more difficult for the union to articulate a message for every affiliate and member, a challenge the NEA is also facing. � There continue to be concerns about whether the standards got it right for students with disabilities and in the earliest grades. Perhaps bowing to those concerns, the AFT's Innovation Fund will allow certain affiliates to take time reading, reviewing, critiquing, and revising the standards. � Most of the delegates speaking in opposition to the standards suggested that it was impossible to separate the standards from the aligned assessments that the U.S. Department of Education has helped fund. In pushing for the assessments (and for such a quick timeline for putting them in place), has the department jeopardized the standards' future? We are, in any case, certainly seeing more and more efforts to delay the tests. Here's a transcription of some of the major debate: From Sarah Chambers of the CTU: "These standards are crippling our students' education and their joy of learning. As a special ed. teacher, I've seen my students transformed from smiling children excited about learning to students who cringe when they're made to read passages several grade levels above their [abilities]. This resolution speaks to the promise of the common core, and this promise is to test, test, and overtest our babies. Do not fool yourselves: You cannot have the common core without high-stakes testing." Michael Mulgrew, the president of the United Federation of Teachers, the New York City local: "I have heard the stories about how Eli Broad and [Bill] Gates and a flying saucer full of Martians designed these standards. ... Now we have teachers unpacking the common core, and we are seeing the promise. What bothers me more than anything is the idea that the AFT would back down from a fight. Those standards are ours; the tests are ours; we are fighting because they took tests from us, and we're going to take it back from them. It is our profession." Michelle Gunderson of the CTU (are you noticing a pattern here? ): "The common-core standards were not created with teaching and learning in mind. They were created with testing in mind. The College Board got together and decided what their students should look like, not our students." (Clarification: The College Board didn't write the standards by itself but it did have representatives on the panels that crafted them.) Casey Carlson, a special education teacher, Greater Santa Cruz (Calif.) Federation of Teachers: "I have high expectations of my students, and when they leave my high school, they have to function in the world, and I want them prepared." Karen McGee, New York State United Teachers: "I pose the questions to you today: If not standards, then what? A free-for-all? Everyone does what they please? No common base? No common method to look at what they're doing? ... The implementation of the common core in New York was absolutely an embarrassment; we were testing before we were teaching; the materials were not developmentally appropriate. That being said, we have an opportunity." Pia Payne-Shannon, Minneapolis Federation of Teachers: "As a teacher in a classroom who's not trained in special ed. services, and whose kids are not getting services they need to teach them grade-level content, I'm opposed to these standards. ... I'm opposed to corporate-backed standards where we were not [consulted]. ... They were not written with success in mind. These standards were written with failure in mind." Colleen Callahan of the AFT's Rhode Island chapter: "This organization and my Rhode Island members have a long history of advocating for and supporting high standards. We don't want our students to be set up, and I don't want, and we don't want, our teachers to be set up. And we believe that standards help level the playing field for all." Carol Caref of the CTU: "This debate is not about standards. [Common Core State Standards] were not developed to improve teaching. They were never about education. They are a business plan, not an education plan. Their purpose is to allow Pearson and other education profiteers to sell education materials to a national audience. ... It is part and parcel of the top-down corporate reform. It cannot be separated from the accountability measures." I very much appreciate Katie Gilson's first-hand report from Los Angeles. Kudos. Kudos. Katie Gilson has done a superb job describing the action, or inaction of the almost useless AFT convention in Los Angeles. Forgive me. In my mind, there is no wonder why the leadership of AFT has sat on its hands as teachers in Chicago and around the country are being unfairly attacked and accused of creating the mess our children are suffering in terms of education. As I read the article, my brain was trying to register UFT's resistance to fight against "Common Core." The federal and New York state governments are having an easy time bringing about detrimental change to the mostly minority students who will get no proven benefit if Common Core is voted on and passed by the AFT body. The bullies and other members of UFT remind me of the sellout preachers of Chicago who are still in the pockets of mayor Rahm Emanuel. They did as they were told and it seems that the AFT and the UFT in New York are doing as told to set up teachers around the country to be reduced to glorified babysitters, disrespected and underpaid. The time has come and gone for the leadership of the national American Federation of teachers. When I heard the name, Randi Weingarten, mentioned and welcomed by President Obama as he was introducing "race to the top" the federal governments replacement plan for Bush's "no child left behind," I knew then that the AFT was compromised. If you stand for teachers in an atmosphere of hate and ridicule, you would not be invited to the White House by any sitting president. As the candidate for president of the United States back in 2004 said, "it's time for a change," is an understatement when it concerns the AFT. I am not a teacher, but I know many, and to see what's happening to them and the millions of students in the public school systems of the United States, I fear that if nothing is done to support the efforts of the Chicago contingent of the AFT, and the only city, among some others, to try to protect their profession, there will be great and well deserved regret for those who are too afraid to take the needed stand to be apart of this historic chance to rescue millions of students, great teachers, potential great teachers and jobs. Its been time for a change, but it is up to the membership to make it. Stand for your rights teachers! AFT has become irrelevant in national teacher politics. Groups like BATS are the future of union activism. Spectacles like the recent AFT convention are anachronisms relegated to the dust bin of history. Can't the rank and file call for a vote of no confidence in Randi Weingarten and her New York henchmen and women? Karen Lewis would be a much better President. Randi can always get some job with her financiers, Bill Gates, Eli Broad, or one of the Waltons. Dump Randi. She should not be union president. Great idea, but the major hindrance would be Randi's AFT / UFT thugs who bully people into voting their way. Their gangster behavior at the AFT Convention was ridiculous. I thought we were beyond bullying. Apparently the UFT Leadership didn't get the memo. Even their Sargent of Arms needed reprimanding to follow the rules. Really people? I had New York teachers apologize for their leaderships behavior. Many people told me they vote the way their union tells them and some hadn't even read the resolutions prior to the vote! As my Attorney Grandfather would say "Never sign or vote on anything you haven't read." Although I don't remember him, it's the best advice I ever received. I congratulate Kati Gilson for her brilliantly written critique of what happened with the Common Core debate at the AFT convention. With spectacular accuracy, Kati described the antics and lengths to which New York and the AFT leadership went to defeat the Chicago union resolution to dump the Common Core as destructive to students and teaching. This article, however, makes the reader despise the AFT and while maybe that needs to happen,there was much else that happened at the convention that was eye-opening to delegates leaving them with a profound and valuable experience. Maybe we should somehow indicate that one overripe apple did not ruin the whole pie. I thank you for your article, but must respectfully state that my perspective on what transpired at mic 4 is markedly different from your report. I am a delegate from Rockville Centre, NY (not UFT), who, although not in attendance at the Education Issues conversation, was present at the general session, seated in the second row, immediately behind Sarah Chambers (CTU) and Nathan Goldbaum (CTU) during resolution debating and voting. From my seat, I easily observed what transpired in the minutes prior to incident addressed in the author�s article. To help you gain perspective, during the preceding day�s discussion, I observed attendees who brought extra chairs and placed them in the first and second rows, so the �irregularity� portrayed by you was not unique to that morning�s session. I do not know where you were seated during the incident addressed in your article. However, when I walked in, there was a Chicago Teachers Union delegate sitting on the aisle next to me in the second row, which held four seats. She was holding a seat for another delegate, who had gone in search of a cup of coffee. The other delegate returned - they were on the aisle and I sat closer to the side doors, with a delegate from WS (not UFT) to my left. When the delegate from SF (not UFT) arrived, an extra seat was brought for him. It was positioned in next to the delegate from RI (not UFT). A UFT delegate was seated to the right of Mr. Goldbaum. A UFT delegate had the other seat in the group of four, front row, closer to the aisle, but he generously offered his chair to the RI delegate who had forfeited his seat when the decision was made to remove fifth chair. The UFT delegate moved to another seat in a neighboring section, near mic 4, without a comment. To sum up, this whole incident was not one-sided, with UFT bullying the CTU members, as I interpreted from your article. As leaders, we talk about the need for unity and actively work towards solidarity. While passionate, your reporting was factually incorrect, from my perspective, and pitted the UFT and New York as a whole against that of Chicago. If ignored, this type of reporting is counterproductive to our efforts as unionists across America. Accurate facts provide the strength that we require in working together. Perspective is indeed a funny thing. The goal of maintaining solidarity within our union is not. I understand that we may not agree on how we perceived the circumstances surrounding "Mic 4" on the day in question, but hope that we may work together, in unity, towards the common good for our union. Randi Weingarten: Worst thing to happen to the union movement since Ronald Reagan.